This week’s Wacky Wednesday Sale includes Twinings African Rooibus Keurig K Cup Tea for $9.99 per box of (24) and Green Mountain Wild Mountain Blueberry K Cup coffee for $11.99 per box of (24). The Rooibos tea is caffeine free with a pleasant sweetness, and should be great brewed over ice – perfect for Summer! 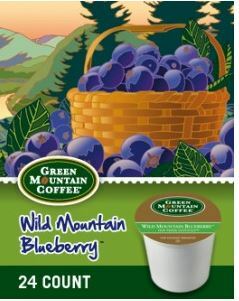 If you are looking for a coffee flavor with a twist, the blueberry coffee tastes like a buttery, blueberry pie in a cup of coffee! In addition to these deals, they are offering the Keurig B145 K cup brewer with a $20 discount, plus a FREE (12) count sample pack of Kcup coffee!